In addition to Silicon Valley, a new hotbed for technology firms and industries has emerged in Los Angeles. Entrepreneurs and high-technology companies, both large and small, are attracted by the weather, nightlife, abundant transportation choices, and quantity of talent that the emerging college educated population provides, with the percentage of college-educated residents in the Los Angeles area more than doubling in the past 40 years. From a tax standpoint, the more time spent developing new products and technical services, the greater the likelihood that companies will qualify for the R & D tax credit. The 2012 list of Inc.'s 500 Fastest Growing Companies has over 350 just from the Los Angeles metro-area, many of which are in tech industries. In high-tech industries, venture capital funding exceeded $950 million among the 5,400 firms with a Los Angeles presence in 2011. More than a quarter of these companies are tech start-ups, and the Venture Capital Association lists the L.A. area as the fourth best city for tech start-ups. The California Economic Development Department (CA EDD) lists the 'professional scientific and technology' as having the second highest LA County job creation percentage of non-farming industries in 2011. With highly ranked engineering programs including Harvey Mudd College, Caltech, UCLA, and USC, technical talent is abundant in the Los Angeles to fill the above-listed jobs. In recent years, the Los Angeles Unified School District (LAUSD) seen a sharp increase in applications to the district's 172 magnet programs, many of which are focused in sciences and applied mathematics. Currently, over 50,000 students are enrolled in LAUSD public magnet schools, with thousands more in private schools throughout the area.9 Many of these schools provide an interactive and collaborative learning environment, showing a shift from 20th century textbook-passive learning to research-driven, active learning emphasized by 21st century teaching advocates. With these specialized schools potentially serving as feeder schools to the above mentioned colleges and universities, the quantity of homegrown talent in technological fields will likely see a significant increase in the next decade. For over 20 years, companies in California have taken advantage of the state's Research and Development Credit, one of the most beneficial in the country. The non-refundable credit is equal to 15% of the incremental qualified research expenses incurred in the state over the calculated base amount, plus 24% of the basic research payments over the base amount paid to independent research institutions and universities. Similar to the Federal credit, eligible costs include wages, supplies, testing expenses, contractor research expenses, and patent related expenses. Qualify as a business deduction under IRC 174. In 2010, claimed California R & D credits totaled $1.6 billion. 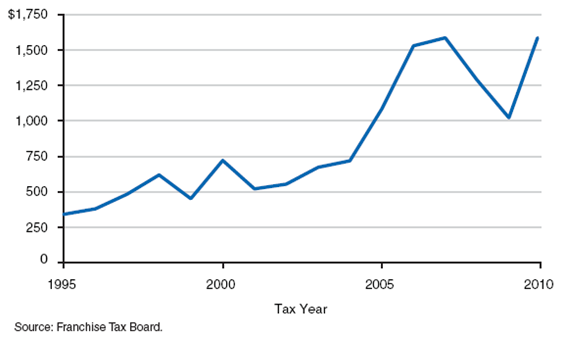 The California Legislative Analyst's Office provides the graph below illustrating the credit usage. After a sharp decline in credit claims post-2006 to about $1 billion coinciding with the economic downturn, claims quickly rebounded to its previously high level by 2010. Many startups moving into the greater Los Angeles area are primed for the both the Federal and California tax credits, as a large percentage of them are in a qualifying industry and meet the necessary criteria to receive the available incentives. In late 2011, technology giant Google opened a new 100,000 square foot office in Venice, which will initially house 500 employees (including 375 engineers). Other large companies with R&D operations in the L.A. area include Boeing, Eaton, Lockheed Martin, Activision Blizzard. and Easton-Bell Sports. The greater Los Angeles area is home to over 40 Fortune 1000 companies, many of which are involved research and experimentation activities. These national companies, if profitable, are able to take the Federal R&D credit for all of their US based operations in addition to the California credit for activities in the state. The Los Angeles tech industry is innovating at a rapid pace. Companies, large and small, are spending billions on research and development activities, making the both the Federal and California R&D credits lucrative to pursue. Companies in technological industries creating highly innovative products and processes should be working closely with their tax professionals to build in documentation processes to their current R&D activities. Tax advisers involved with firms in the region should monitor these developments and assist their clients in obtaining R&D tax credits. The abundance in talent available should ensure that innovation will be coming out of this area for years to come.